We talk often about underwriting. The underwriting process is what determines if you can be approved for life insurance coverage, how much coverage you can own, and how much you will have to pay. Underwriting is a big deal, but we have never really explained in-depth what it all means. Well, there’s no time like the present! After much ado, let’s really get into the nitty-gritty of the mysterious world of life insurance underwriting. Why does working with multiple insurance companies help? Life insurance underwriting is all about risk. Your risk level is directly proportional to the premium you will pay. If you’re less risky than the average to insure, you pay less. If your risk level is higher than average, you pay more. Underwriters at the company determine your risk level by evaluating a number of things unique to you including your lifestyle, occupation, medical records, financial history, and driving record. Not all life insurance companies evaluate certain risk factors in the same manner. Quotacy will help you find the best company for your life insurance needs. Underwriting is an evaluation of a client’s health and medical history, occupation, hobbies, lifestyle, characteristics, and financial status that may affect life expectancy. There are two parts of underwriting: 1) financial underwriting and 2) medical underwriting. Let’s dig a little deeper into each. Financial underwriting is the evaluation of an insured’s personal or business background and current economic circumstances. The purpose is to make sure the amount of insurance purchased is reasonable and in line with the insured’s needs. This is important in preventing being over-insured. Being over-insured means the policyowner would be purchasing more coverage than necessary, but more importantly, life insurance companies want to make sure someone isn’t worth more dead than alive. It sounds a little gruesome, but it’s an important step in preventing nefarious deeds. When underwriters evaluate an applicant’s finances, they follow guidelines do to so. They don’t simply just look at how many children you have and make up a coverage amount to approve you for. They review the full application and if some financials aren’t lining up, they may even ask for further information to ensure the coverage applied for is the coverage needed. Let’s look at some common scenarios. If a married father is applying for $500,000 in coverage, the underwriter will determine if this is reasonable by multiplying the applicant’s income by a certain amount. This amount is already laid out in the company’s underwriting guidelines. For someone 40 years of age or younger, a common multiplier is 25. Let’s say this applicant is 35-years-old and he earns $50,000 annually. We calculate 25 x 50,000 to be 1,250,000. So, as long as this applicant is applying for $1,250,000 or less in coverage, the underwriters are typically not going to question it. This isn’t to say they wouldn’t approve a higher amount, but you’ll need to justify why. Life insurance is essentially income replacement. An income’s purpose is to pay for a certain standard of living, and a big portion of this income is likely to go toward living arrangements. Buying life insurance coverage that includes the total amount you have left to pay on your mortgage is common and acceptable. If someone applies for life insurance coverage of a large amount and lists a charity as a beneficiary, underwriters may dig a little. They will first check to ensure the charity is legitimate and may look at the applicant’s past contribution history. If a business applies for coverage on an employee, underwriters typically need a description of why this person is a “key” person and they check to make sure coverage is no more than 5-10 times the annual compensation. If a business is applying for a larger amount, they may ask for further explanation and documentation. Insurance companies want to understand as much as possible about a potential policyholder before approving the insurance policy. Insurance companies want to understand as much as possible about a potential policyholder before approving the insurance policy. The insurer will examine the medical history, lifestyle, and other factors that relate to the individual’s medical needs, and, through actuarial analysis, make an estimate of the risk associated with providing coverage. Smoking contributes to conditions such as heart disease, emphysema, and cancer. It’s a biggie. Cigarette users generally present greater mortality risks than users of other tobacco products such as cigars, pipes, or chewing tobacco; however, not all carriers distinguish between the various forms, so this is one reason as to why working with Quotacy is beneficial because you get multiple companies to choose from. When you enter your smoking status into our quoting tool, it takes your responses into consideration when calculating what price each company is likely to offer you based on your smoking status. The screenshot below is from our tool showing a few of the various quotes possible for a 30-year-old male who uses chewing tobacco weekly. 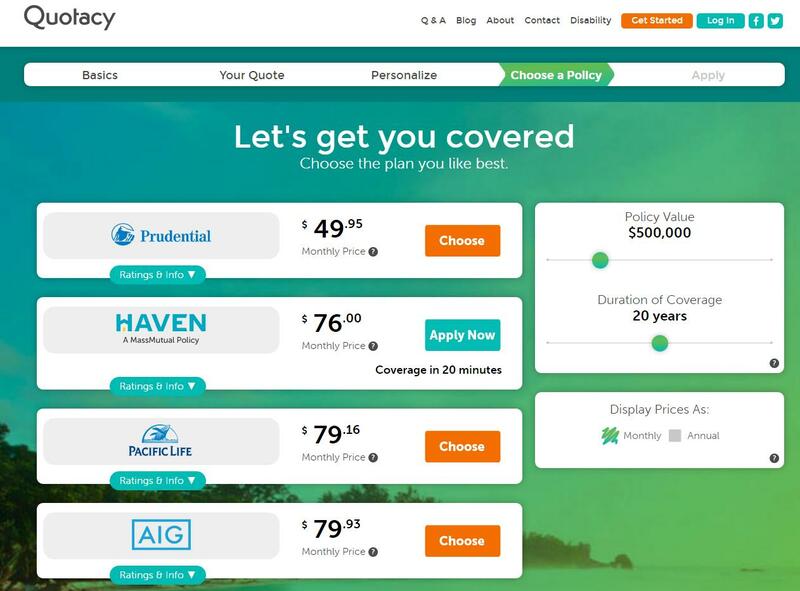 As you can see, the prices vary considerably between the different life insurance companies. The abuse of drugs and alcohol may lead to higher incidence of violent death including accidents, suicides and homicides, and risk of death due to physical disorders that result from years of abuse. Alcohol abuse may affect the gastrointestinal tract, liver, heart, and nervous system, and increase risk of cancer. 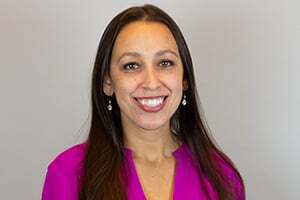 If an applicant has any history of drug or alcohol abuse, the insurance carrier may opt to raise premiums or decline the application altogether. A history of careless driving, speeding, or driving while intoxicated increases risk of motor vehicle accidents, which means there is a higher risk to insure someone with this type of history. If an applicant has a poor driving record, the type of violation, how many they have had, and the severity of the violation will all be taken into account. Height, weight, and body mass index (BMI) are common life risk characteristics measured by insurance companies. Both overweight and underweight individuals have increased mortality. Significantly overweight individuals have an increased risk of heart disease, diabetes, high blood pressure, and high cholesterol. Being significantly underweight may indicate an eating disorder or an acute or chronic illness. Life insurance companies are more lenient in determining what exactly is “overweight” and “underweight” when comparing to a BMI calculator though. 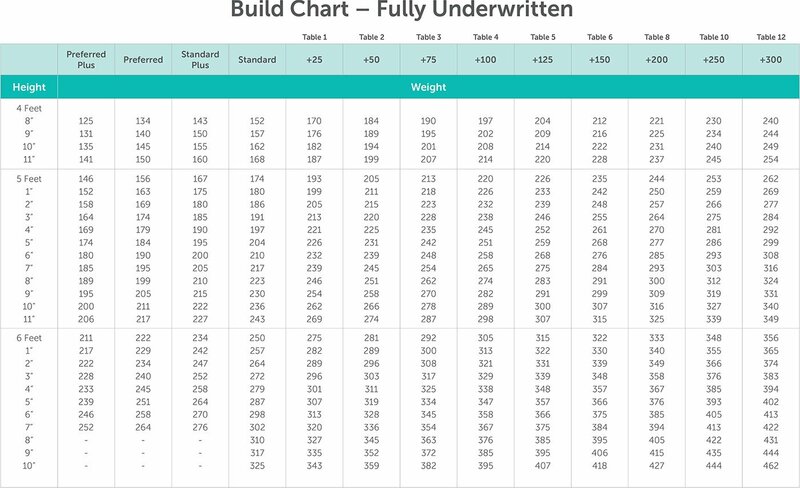 Using the real-life underwriting build chart below, someone who is only 5 feet and 3 inches tall can weigh 165 pounds and still be qualified for Preferred Plus, which is the best offer you can have. Meanwhile, a BMI calculator would say that person is overweight. High blood pressure indicates that the heart is working harder than normal to pump blood, adding stress to the heart and arteries. An individual with high BP has a greater risk of heart attack, stroke, and kidney failure. In addition to the life insurance medical exam, if necessary depending on the policy, underwriters will examine medical records and look at the recorded blood pressure readings and average them out. This can be helpful if an applicant has “white coat syndrome” and their blood pressure spikes due to stress during the insurance paramedical exam. Cholesterol is a measure of fatty substances (lipids) found normally in the blood. There are two types of lipids: low-density lipoprotein (LDL) and high-density lipoprotein (HDL). You may have heard of “good” and “bad” cholesterol. LDL is the bad kind and HDL is the good. LDL collects on the artery walls which prevents oxygen-carrying blood from easily getting to the heart muscle. HDL is thought to carry cholesterol away from the tissues and may help protect against heart disease. Your cholesterol levels are found in examining your blood. Ideally, you want the test to show your HDL score to be high and LDL to be low. Having high cholesterol is referring to when you have high levels of LDL and triglycerides and low levels of HDL. With high cholesterol, you are more likely to have a condition called atherosclerosis, in which plaque builds up in your arteries. The plaque can clog arteries and make them less flexible, which can increase your risk of having a stroke or heart attack. No two life insurance companies underwrite in the exact same way. Like with the smoking example, getting quotes from multiple life insurance companies is the best way to make sure you get an affordable policy and one that is right for your particular situation. Quotacy works for you, not any particular life insurance company. We’re unbiased and just want to make sure you get affordable coverage to ensure your family is protected. We want to help, and we can help. If you’re in need of life insurance coverage, start by getting a term life insurance quote today. When you apply for life insurance, the life insurance underwriting process is the process that determines if you can get coverage, how much coverage you can be approved for, and at what cost. Underwriters are the people who evaluate your application to determine all of this. They use underwriting guidelines based on mortality statistics that are calculated by actuaries. The life insurance companies themselves don’t determine the numbers. There are two parts to underwriting: financial underwriting and medical underwriting. If the risk to insure you is higher than the average Joe you’re going to be paying more than the average Joe. But if you’re healthier than the average Joe, you’ll save some money. The purpose of financial underwriting is to make sure the amount you’re purchasing is in line with your needs. This is important in preventing being over insured. For example, a 30-year-old male with no dependents who makes 45,000 dollars a year probably doesn’t need five million dollars in life insurance coverage. The insurance company wants to make sure you aren’t worth more dead than alive. When going through the financial underwriting process the underwriters take many factors into consideration. Some of these factors include your net worth, your family’s needs based on your household income, final expense needs, and if you have any business or debt repayment needs. Everyone has an insurability limit. This is essentially the total amount of life insurance coverage that can be active on a person at any given time. So, for example, Natasha, if your insurability limit is one million dollars and you own a $750,000 policy you will not be approved for an additional $750,000 policy. Exactly. If my insurability limit is one million dollars and I already own 750,000, the most I could get approved for would be another $250,000. The general rule of thumb for most people is that if you’re 40 years old or younger, your life can be insured up to 25 times your current annual income. Every 10 years after age 40, that multiplier is reduced by 5. And if you don’t have an actual source of income the underwriters can evaluate, for example, if you’re a stay-at-home parent looking to buy life insurance, the insurance company will often look for your spouse’s coverage amount and either match that or cut it by half depending on how much it is. And most people don’t max out their insurability limit. The average person just doesn’t need that much coverage. And the second type of underwriting is medical underwriting. This is when the underwriters determine how much of a risk you are to insure. They examine your medical history, your lifestyle, and other factors that may have an effect on your mortality. The probability of a person dying before their “average” lifespan. They then compare your unique factors to the average statistics to determine your level of risk. If the risk to insure you is higher than the average Joe you’re going to be paying more than the average Joe. But if you’re healthier than the average Joe, you’ll save some money. Each life insurance company employs their own actuaries so they all underwrite a little differently. This is why working with a life insurance broker is beneficial. Brokers, like Quotacy, are not tied to one life insurance company. So they can shop the market to ensure you get the best rate for your unique situation. If you have any questions about life insurance make sure to leave us a comment. And if you have any questions regarding today’s topic, check out this blog link: What Is Life Insurance Underwriting? Otherwise, tune in next week when we talk about term life insurance what it is and how it works. Bye. Most people that apply for life insurance do not realize how much information is really collected by the companies until they actually apply. The information in this blog post is very important for perspective applicants to understand before they actually apply. I always believe that taking the minimal time to pre-screen applicants will eliminate surprises later on during the application process. This also is very helpful for the agent to choose the most applicable company to apply with. Great Post!